A layer of low density PE foam bonded to a firm functional base. It is suitable for conditions where additional cushioning is required without compromising mobility of functional control e.g. plantar fascia problems and the tibial stress syndrome. 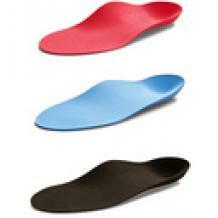 They allow for better tolerance and patient acceptance of orthoses. Good for use in multidirectional sports to reduce forefoot pivoting irritation.